Certainly, Cardinal Montini of Milan was the "favorite" going into the 1963 conclave -- but his election was by no means a certainty. It took six ballots to elect the close collaborator of both Pius XII (Pius had "banished" him from Rome to Milan) and John XXIII (John made him the "first Cardinal" of his papacy and relied on him during the first session of the Council). Although Montini was ahead in the voting from the very first ballot, he barely reached the 54 votes needed. 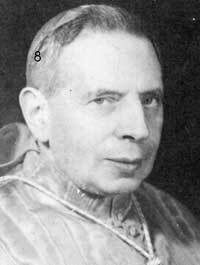 Cardinal Lercaro had many votes in the early balloting; his "progressive" supporters switched to Montini during the 2nd and 3rd ballots. Cardinal Siri's supporters put forward Cardinal Antoniutti and, later, Cardinal Roberti, in hopes of avoiding a Montini papacy. As their numbers slipped away, Montini edged upward - finishing with perhaps only 2 or 3 votes more than needed for election. "There was no atmosphere of elation and, surprisingly, not much sense of relief, either. Montini had reached the throne, but just barely. More than a fourth of the College remained completely opposed to his reign, and that quarter included a majority of those men on whom the new Pope would have to rely daily in governing the Church." There would be continuity -- the Council would continue. But the accompanying reform would prove very difficult to achieve.